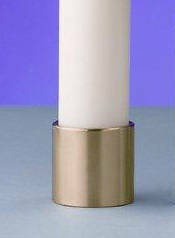 These sockets are designed to be used with Lux Mundi's liquid wax candle shells. Made in the USA of solid brass, these sockets are sold individually (not in pairs) in either a polished or satin brass finish and are available in the following sizes: 1-7/8", 2", 2-5/8", and 3-1/2". They are for cosmetic enhancement and not essential to the functionality of the candles.